Daniel Buren:Le cinéma me passionnait tant que je crus alors que ma vocation était enfin trouvée et que c’était à cette discipline que j’allais finalement me consacrer. La réalité fut différente. La peinture continuait à me hanter et, étudiant de plus près ce que faire un film induisait, je m’aperçus assez vite que l’argent y avait un rôle extrêmement important. Trop important pour moi, même si la ‘nouvelle vague’ semblait ouvrir une porte avec d’excellents films à budget réduit. From: Au sujet de… Entretien avec Jérôme Sans, Paris, Flammarion, 1998. Koen Brams/Dirk Pültau: After the film on Documenta V, in 1972, you actually left the visual arts scene. It was only in 1985 that you made another film about a major art event, the Paris Biennale. Jef Cornelis: I dropped out in 1972. That was pretty radical. I still went to exhibitions and stayed in touch with a number of people, but I wasn't involved any more. Documenta V – 1972 – was in my opinion the beginning of the commercialization and the breakthrough of the mentality of ‘every man for himself’. K.B./D.P. : In 1985, why did you want to go back to making films on the visual arts? J.C.: I had been doing a live programme, IJsbreker (Icebreaker) in 1983 and 1984, 22 episodes in all. IJsbreker created a lot of commotion – even on the executive board. It often got out of control. Even Paul Vandenbussche, general director of Belgian Radio and Television (BRT), thought I had gone too far. What I actually wanted was to increase the IJsbreker broadcasts to twice a month, but I felt I should stop broadcasting live because I was causing too much turmoil. The ratings were quite good, but the programme upset everybody. IJsbreker was live television. There was no control over what happened during the broadcasts. I had to disappear, hide under the table, be invisible. K.B./D.P. : Visual art as a form of camouflage? J.C.: Yes, initially, because it was a field where I would encounter less resistance. K.B./D.P. : In 1985, did you find the art interesting again? J.C.: Yes, probably because I had been gone for so long. When you leave something behind, and then return to it later, you tend to think that maybe you had misunderstood it. K.B./D.P. : Were there other events or other artists in ’85 you wanted to focus on? Or did you specifically want to portray the Paris Biennial? J.C.: I remember that I was curious about the Paris Biennial. I always thought it was a special event. Daniel Buren, Olivier Mosset, Michel Parmentier and Niele Toroni performed there together in September, 1967, for the last time. That was in the back of my mind. I knew a lot was happening there. Don’t forget that I had always kept up with architecture. In 1985, the Paris Biennial was held in Parc de la Villette for the first time. Moreover, I was also aware of the financial resources that Kasper König and Co. had at their disposal. K.B./D.P. : You mentioned Daniel Buren. Buren keeps appearing in your films during the 1980s. He figures prominently in the film on the Paris Biennial, but also in the film on the first exhibition at Castello di Rivoli in 1985. In 1986, you were a witness to the stalemate about Buren’s work on the Cour d’honneur at the Royal Palace in Paris, and in that same year, you completed De langste dag (The Longest Day), the film about Jan Hoet’s Chambres d’Amis, which opened with Buren. That makes four films in which Buren plays an important role. J.C.: I was interested in strategy at that point, how artists jockey for position at the big shows. That has always intrigued me. I was also fascinated by Kasper König for the same reason: his greed and his method of gaining territory. K.B./D.P. : There was also the film about the 1987 Münster Skulpturprojekte, Een openbaar bad voor Münster (A Public Bath for Munster). You show some of Buren’s work in this film, as well. Why was Buren so important for you in this period? 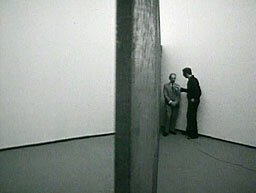 J.C.: Buren played a leading role in the art scene for a long time. He was very articulate – most of the organizers were afraid of him. But I did not focus specifically on Buren. I was also curious about the positions of the four organizers, Kasper König, Alanna Heiss, Achille Bonito Oliva and Gérald Gassiot-Talabot. K.B./D.P. : You were interested in Buren because you could discuss strategies with him? J.C.: Exactly, and he knew precisely what was going on behind the scenes. If you go there and you don’t know what’s going on, you can forget it. K.B./D.P. : There was also the action Pas de Belges à Paris (No Belgians in Paris), at that time, an event organized by Initiative ’85, from Ghent, protesting the absence of Belgian artists at the Parisian biennial and other international shows. Did that play a role as well? J.C.: No, absolutely not. I never thought about that at all. K.B./D.P. : You made the Paris Biennial and Castello di Rivoli films with the Belgian gallery owner Joost Declercq. When did you start working together with Chris Dercon? J.C.: Joost Declercq was already selling art. A lot of artists came knocking at his door. That was interesting. K.B./D.P. : Which was your first film with Chris Dercon? J.C.: De langste dag, (The Longest Day), but he had a limited role in that film. After that, I worked with him on a film about art education and on the films on Sonsbeek ‘86 and Munster ’87, and finally on Little Sparta, et in arcadia ego. K.B./D.P. : Why did you want to work with Chris Dercon? J.C.: Chris’s linguistic skills are exceptional: four languages with no problem. And he is good at making contacts, connecting with people. K.B./D.P. 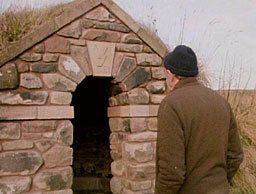 : Where did the idea originate to make a film about Ian Hamilton Finlay, your last project with Chris Dercon in the 1980s? J.C.: It was Chris Dercon’s idea. But Chris didn’t propose it until it became apparent that the film we really wanted to make would not happen. We wanted to make a film about James Coleman, about his short films that virtually no one ever saw. I’ve always been interested in that, in artists who create various kinds of work, but where you just get to see fragments of it. A few days before we were to leave for Ireland, Coleman called to announce that he no longer wanted to cooperate with the film. That’s when Chris came up with Ian Hamilton Finlay. K.B./D.P. : Did you ask Chris why he wanted to make a film on Finlay? J.C.: I don’t remember, but I can tell you why I was interested in Finlay. I was curious about Finlay’s garden. I had gone through the whole history of French and English gardens, and I was curious about what Finlay’s garden would look like. Anyway, our preparation time was very short. We had very little time, and we had to leave. I’ve always survived on leftovers – on having resources and people for four days, quickly travelling back and forth. That has always been a part of my professional existence. K.B./D.P. : Who made contact with Finlay? J.C.: Chris approached Finlay. Because we had worked so long preparing for the film on James Coleman, he tricked Finlay into working with us. He called him and said, “We’ve written you letters and haven’t received any reply.” But we hadn’t sent any letters! Finlay finally agreed that we could come. K.B./D.P. : At the same time that you were travelling to Scotland, there was a bit of a riot going on in France about Ian Hamilton Finlay’s work. As a result of his exhibition in the ARC in Paris, Catherine Millet attacked him head-on in Art Press, in the June and July issues of 1987. A quote: “At l’ARC, in Paris, an English artist, Ian Hamilton Finlay, has inscribed the letters SS on stones … Lord knows art is sometimes a farce: just ask Barbie..” Hadn’t you read those articles? J.C.: We didn’t know Finlay had a commission to make a monument to commemorate the French Revolution. K.B./D.P. : That business hadn’t started yet, but had you had read the texts by Millet? J.C.: Probably. We had Art Press at our office. We knew the texts, but the contacts with Jonathan Hirschfeld did not come about until later. J.C.: …while we were there? K.B./D.P. : …while you were there! J.C.: We knew nothing about it. K.B./D.P. : Undoubtedly, because that correspondence was only revealed later, by Hirschfeld and Finlay. J.C.: I found Catherine Millet’s texts polemic, and I wanted to see Finlay’s work with my own eyes, but it was Chris who had drawn my attention to Finlay. Otherwise, I would not have gone. K.B./D.P. : You must have been interested in a character like him, someone who might be on the wrong side of the fence. J.C.: Yes, I wanted to see that work at some point, but the issue only became apparent to me when I personally met Finlay. K.B./D.P. : But you knew beforehand that there must have been a reasonable chance that … You wanted to explore that? J.C.: Yes, but I was more fascinated by the garden. K.B./D.P. : Were you already acquainted with Finlay’s work? He had also participated in the Documenta. Did you see that Documenta? That was in 1987. Had you seen the work before you went to see him? J.C.: I did see the Documenta, but I don’t remember Finlay’s work in particular. K.B./D.P. : His work consisted of guillotines, and there were texts affixed to the guillotines. J.C.: Now that you mention it. I wasn’t really impressed by it. I didn’t think it was a strong piece. It was so banal that I forgot about it. K.B./D.P. : What else did you know about Finlay? J.C.: I was probably familiar with his writing and perhaps I had seen pictures of his sculptures. But when we were preparing the film, I was chiefly occupied with the garden. I think Anton Herbert and Jan Debbaut had told me about it. In any case, I did know that Finlay was particularly fussy about allowing access to Little Sparta, his private domain. K.B./D.P. : You arrived in Scotland on November 21, 1987? J.C.: Yes, I arrived together with Chris, a day before the cameraman and the sound technician. November 21st was a Saturday. We didn’t contact Finlay, but we did drive around the vicinity of Little Sparta, because it was not easy to get into. K.B./D.P. : The next day, Sunday, the technical team arrived. Did you go see Finlay then? J.C.: No, we didn’t talk to Finlay until Monday morning. He didn’t want to see us until Monday – from Monday through the following Saturday. Chris contacted Finlay from a phone box. K.B./D.P. : That telephone scene, that’s the beginning of the film! That was your first contact with Finlay? J.C.: Exactly. That is literally the beginning of the film. We told him afterwards that we had taped it. K.B./D.P. : Would you say that you didn’t take Finlay seriously from the very beginning? K.B./D.P. : It is an odd beginning in all respects. Right from the start of the film, it is obvious that something strange is going on. That feeling is of course reinforced by the soundtrack. J.C.: George de Decker did the sound. J.C.: That red telephone box – that is Hitchcock. You need to have a beginning and you need something that is solid right away. In general, I think the beginning of a film is important – how you enter a film. How does one begin? K.B./D.P. : Chris Dercon’s conversation on the phone, that was not rehearsed? J.C.: No! Chris and I wanted to discuss the weather. Finlay didn’t know anything about it. K.B./D.P. : Was the telephone scene your idea? J.C.: I don’t remember. But the following scene was definitely my idea: the sheep scattering in panic, while a Scottish boy recites a poem off-screen. It was one of Finlay’s poems and I absolutely wanted a child’s voice. I found the boy in the café at our hotel. K.B./D.P. : Did you already have that book with Finlay’s poems before you left? J.C.: No, I got that from Finlay on one of our better days at Little Sparta. K.B./D.P. : What else happened, that Monday? You gained access to the domain? J.C.: Before we went in, we took the shot of the red car, the one I was driving. K.B./D.P. : Why a red car? J.C.: I thought it was amusing. You must have seen that all the sheep had red marks on their backs? Well, I thought a red car had a certain something. K.B./D.P. : What did you do afterwards? J.C.: We shot the scene where Chris is walking through the woods, among other things. I was interested in that, the pastoral, the cold with the animals still out there in the fields. I thought it was a magnificent landscape. We also set up the scene with the battleship sculptures in the Roman Garden. At five o’clock, we discussed the schedule for the rest of the week with Finlay. K.B./D.P. : What were your working days like from Tuesday on? J.C.: I was lucky that the temperature went down below freezing. I thought the frost was brilliant, but Finlay found it horrendous. We started work every day as early as possible, because it was already pitch black by five o’clock. We had our own place to work – we even ate separately. We didn’t see him during the day unless he had a scene to do. Then he would show up. K.B./D.P. : What did you actually want to do with the garden? You said you were crazy about it. J.C.: I had never done anything on a garden before and that frustrated me. I would have loved to have done something with gardens in Japan. I mean it. K.B./D.P. : There were several artists at that time, in the mid-1980s, who were working with gardens, people like Fortuyn/O’Brien. That was obvious at Sonsbeek ’86 – the reconstructed idyll of the garden. Does that have something to do with it? Or were you interested in it beforehand? K.B./D.P. : There is no overview of the garden anywhere in the film. J.C.: No, you can’t see very far. What he did with that fence. I think a fence is a strong thing. The way he did that, with the text on it, was very clever. K.B./D.P. : You could have used the camera to reveal the garden. You didn’t want to do that? Instead, you focused on the artworks and the nature surrounding them. J.C.: I think that garden is artistically strong. I still think so. Little Sparta is in a strange location, something like Kalmthout heath on the Dutch-Belgian border, but much worse, an area somewhere between Edinburgh and Glasgow that had been stripped bare for brown coal. And he made a garden of delights out of it. He digs ponds, fills the site with undertones of aggression and violence. He’s capable of evoking a great deal with very little, in the little ponds, as well. With few resources, Little Sparta became a very dangerous place. It is the best summary of his work. There are treasure hunts and tales of adventure – the creation that just keeps expanding. You could look at the whole world that way if you’re not careful. But you have to experience it in the summer. He is right about that. K.B./D.P. : On the one hand, you respect Finlay’s project, but on the other, Chris Dercon asks Finlay why he let you go there in the winter. Isn’t that a perverse question, because it was you who had asked to visit Little Sparta in the winter? J.C.: The question was asked because he had a problem with it, I suspect. Apparently the garden was brilliant in the summer, but I thought the timing was right: a garden in winter, who else would do that? K.B./D.P. : You filmed from Monday to Saturday. What happened on Wednesday? J.C.: On Wednesday, we taped the scene on the First Battle of Little Sparta. Finlay had gotten into a conflict with the tax authorities. A few skirmishes took place then in Little Sparta. Dercon and Finlay were walking alongside each other and Finlay was showing where they had entrenched themselves. There are photographs from that First Battle in the film. At a certain point, Dercon and Finlay were completely in agreement. J.C.: Chris and Ian had found a common cause in their opinions about a project on art they disapproved of, which they called ‘entartet art’. On Wednesday, they were trying to pin it down. I couldn’t do that. I had my own doubts about Finlay’s work. J.C.: They were talking about an exhibition of work they didn’t think was any good. They wanted to do something together in Los Angeles. For them, it probably also had to do with the evil influence of American cultural imperialism. ‘Entartet’ was just their term for it. The two of them were just messing around and it gave me the creeps. So I gave them a piece of my mind. K.B./D.P. : What was your problem? J.C.: A smell I can’t stand. K.B./D.P. : That he wore a vest with the German flag? J.C.: No, I knew about that. K.B./D.P. : You knew about that? What bothered you then? J.C.: I had been let into his library. A library breathes a person’s character: what’s there and what isn’t. K.B./D.P. : And what was in that library, then, that struck you? J.C.: There were references to book burnings. But it wasn’t just the library, it was also his work. Some of his texts are plainly suggestive. I thought his pieces interesting – in that sense I still haven’t let go of Finlay. For example, See Poussin/Hear Lorrain, simply chiselled sculptures. I thought, by the way, those pieces were better in the winter than in the summer. Or the sentence, Claude, Vlaminck, Corot, Ruysdael, our famous weathers. Now that’s a sentence! The ambiguity of his work attracted me, but I felt that it needed to be clarified. It is present everywhere, throughout all his work. War and destruction are very deep in his work. But is that just speculation or provocation with respect to our current world? That had to be discussed. K.B./D.P. : You worked outdoors from Monday through Thursday. The interview with Finlay takes place on Friday evening. J.C.: Friday evening. On Thursday, I finally got Chris to see my side of it. I convinced Chris that he had to ask Finlay that question. I thought there were some concerns. K.B./D.P. : How did Chris react? J.C.: He finally agreed to do it. K.B./D.P. : The film ends with Chris Dercon’s interview with Finlay. Before that, you show his Grotto of Aeneas and Dido. Finlay had applied an “S” above the door of the building, in the shape of a lightening bolt or an SS insignia. Did you intentionally edit that shot into the end of the film? J.C.: No, because we had already determined the sequence beforehand, in consultation with Finlay. The editing follows the chronology of the shooting. K.B./D.P. : First you see Finlay walking around in a coat with a German flag on it, then that “S” comes into view. As a viewer, you start asking more and more questions. And those questions eventually come into the conversation between Dercon and Finlay. J.C.: I had to know and I convinced Chris to put him to the test. J.C.: Chris was awkward when he asked that question, he didn’t know how to word it. But Finlay got angry. He said he didn’t think it was fair. He was out of character. The friendly man was suddenly a very pissy somebody. It was very conspicuous. K.B./D.P. : That is understandable. He’s being attacked in Art Press, and you two come along and ask the same question. What happened when the camera was turned off? J.C.: The camera wasn’t turned off. We ran out of film, literally. At the end of the interview, a cat came in, Finlay said something else, and there was no more film. Afterward, we were not immediately kicked out, but it was close. He accused us of having been sent by Art Press. He even claimed we were spies for the French secret service. He said we were only out to sabotage his projects in France. He added that he had received a phone call that day informing him that two major commissions had been cancelled in France. K.B./D.P. : But that was impossible, because one of the big commissions, the monument for the French Revolution, was cancelled much later, in 1988, in fact. J.C.: Perhaps it hadn’t been made public yet. I’m only telling you what he said to us. He did say it to us. How else would I know about it? K.B./D.P. : It was only on March 25, 1988 that Radio Europe 1 had a debate about the advisability of having Finlay design the monument, in light of the controversy that his work had earlier incited in France. J.C.: I can only tell you what he was trying to pin on us. We didn’t even know he had the commission. K.B./D.P. : On March 25, 1988, the same day as the debate on Radio Europe 1, François Léotard, the French Minister of Culture, decided to deny Finlay the commission. J.C.: Then he was having us on. K.B./D.P. : I wouldn’t be surprised, after reading the accusations and insults in his letters. J.C.: I only know what he told us. K.B./D.P. : How did the rest of Friday evening go? J.C.: We disagreed, but I made it clear to Finlay that we had made arrangements to work through Saturday. He had, incidentally, already received an honorarium for Tuesday through Saturday – I often did that for artists, if I had the money. Then we returned to our hotel and I told to Chris that I would go back to Little Sparta the next day to do the last shooting. We then proceeded to get quite drunk and sang war songs with some Scots. Chris told me that he would not be going with me the next day. K.B./D.P. : Why did Chris Dercon not want to go back to Little Sparta? J.C.: Maybe he thought he would be ripped to shreds, I don’t know. Finlay ranted and raved at him quite badly. I suspect the Finlay film is a project he would prefer not to be reminded of. K.B./D.P. : What did you still have to do on Saturday? J.C.: I was not going to let them drive me away – they’d have to throw me out. I still had to film the photographic material, of the First Battle, among others. Then I said goodbye to Finlay. I told him to wait and see the film. K.B./D.P. : Did he then have you sign the statement? K.B./D.P. : You then signed a statement agreeing to show the final version of the film to Finlay and that you granted him the right to cut material from the film. J.C.: Yes, you cannot refuse someone that. If I had not signed it, then all would have been lost. It was the only way to go on. K.B./D.P. : Then it was obvious that things would end badly. Didn’t you think so? J.C.: No, I thought everything would still turn out all right. K.B./D.P. : Then you returned to the BRT? J.C.: I edited the film, with a great deal of pleasure. I had an excellent editor, Filip van Hecke. K.B./D.P. : You thought you would manage to get permission from Finlay? J.C.: I just wanted to finish the film, that’s all. K.B./D.P. : Wasn’t it difficult to edit a film that might never be shown? J.C.: If you don’t edit it, it’s all over anyway. The time had been reserved, so it was normal production procedure. K.B./D.P. : On March 25, 1988, Claude Blondeel, the producer of the film, sent a letter to Finlay saying the film would be ready around mid-April. J.C.: The editing was finished, but the sound probably was not. J.C.: In the days and months that followed, scores of letters were sent, from him, from his wife, from several of his associates. It was inevitable that the top of the BRT would get involved. K.B./D.P. : They repeatedly argued that the winter was not the ideal season to film the garden. J.C.: That seemed to be their most important argument. J.C.: Yes, that was crazy. How does something like that happen? The film was shot in November, 1987. The situation came to Cas Goossens’ attention during a meeting of the directors of the European public networks. I discussed it with Goossens. I think he even got a copy of the film, but they didn’t want to broadcast it. Do you know what their argument was? J.C.: The argument was that the contract I had with Finlay was in Dutch. That was the argument! They are not producers, they’re scaredy-pants. They didn’t dare broadcast the film. K.B./D.P. : Finlay can’t institute a legal action against you in England, can he? J.C.: No. Nor do I think he would be proved right. The film has nothing in it that is explicitly negative. K.B./D.P. : But you signed a paper saying that he could have the last word. That gave him the advantage. J.C.: Finlay never came back to that statement I signed in Scotland. No, he simply wrote that he didn’t think it was a good film and that he would take legal action against the BRT if the film were to be aired. He repeatedly demanded that we destroy the footage. K.B./D.P. : He could instigate proceedings in Belgium, as he did in Paris. J.C.: Yes, he could have. They were terrified. The BRT just wanted to forget the whole thing as quickly as possible. K.B./D.P. : You didn’t try to convince Cas Goossens? J.C.: Have you ever sat down with bureaucrats? They hung me out to dry! That was the end of it for me. I just wanted to complete the film, nothing more. K.B./D.P. : That’s an important statement. All you wanted was to finish the film. Whether it was broadcast or not didn’t actually matter that much. J.C.: That’s right. Belgium does not really have an audience that you should get all worked up about, anyway. K.B./D.P. : Whom have you shown the film to since then? J.C.: I showed it to Yves Aupetitallot, who was preparing a catalogue of my work. But that was much later. J.C.: In 1991. Yves Aupetitallot also put together a selection of my films on the visual arts. The films were shown in different cities in France, Germany and Poland. I made sure that Little Sparta, et in arcadia ego was included. That way, it was also shown at the Jeu de Paume, at the same time as the Marcel Broodthaers exhibition. K.B./D.P. : And those screenings were able to continue? J.C.: After the first two screenings of Little Sparta, Finlay’s cronies in Paris woke up. I received a phone call in the middle of the night from Jack Lang’s office – he became Minister of Culture back then. Jack Lang himself was dragged out of bed in the middle of the night. I was told that there would be no third screening of the film. That’s typical Finlay. Le spectacle, mon dieu (the spectacle, my God). K.B./D.P. : Is Little Sparta, et in arcadia ego the only film you made that never reached a television audience? J.C.: Yes. There have been other problems at other times, with Thierry De Cordier, among others. But we were always able to find a solution. Some television projects had been shelved earlier – before they ever got to the filming stage. With thanks to argos for the selection of visual material.